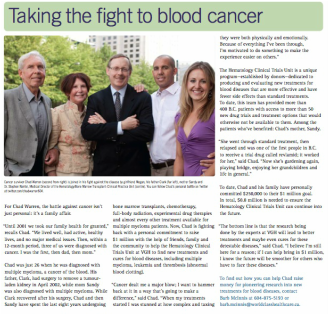 Chad worked with the VGH/UBC Hospital Foundation on a campaign to raise awareness and funds to find a cure for multiple myeloma. He set a goal of raising $1 million for the Foundation's Hematology Research Program (formerly the Hematology Research and Clinical Trials Unit). "I'm very determined to reach this goal and know it's possible. I've met many patients over the years, all of which have a story. It's for them that I've set out on this mission." In 2009, just two months after his second bone marrow transplant, Chad spoke on behalf of patients at media conference with Diana Krall and her family - "An evening with Diana Krall" supports the Hematology Research Program in memory of Krall's mother Adella, who died of multiple myeloma in 2002. Multiple Myeloma is a cancer that starts in the plasma cells of the blood. The cancerous cells multiply out of control and push out the healthy blood cells, leaving patients with weak immunity and anemia. In time, the cancerous cells damage the bones, often in more than one area of the body (that’s why it’s “multiple” myeloma), and other organs, especially the kidneys. The cause of the disease is not known and there is no cure. It used to be seen in only elderly patients, but now more younger people are being diagnosed. Symptoms include pain in the lower back, ribs or sternum, anemia and fatigue, recurrent infections, weight loss, kidney problems, and hypercalcemia (which can cause frequent urination, confusion, loss of appetite, nausea, increased thirst, weakness, constipation, and restlessness). Multiple Myeloma affects each patient differently - varying widely in its severity and progression. Some people will live for years with minimal symptoms. Others have rapid progression of life-threatening multiple myeloma. The Hematology Research Program (formerly the Hematology Research and Clinical Trials Unit) is the research arm of the Leukemia/Bone Marrow Transplant Program of British Columbia where Chad was a patient. The HRP is located in Vancouver General Hospital. It researches blood diseases and develops and tests new treatments for myeloma, leukemia, and lymphoma. If a clinical trial shows that a new treatment is better than the current protocol, the case is made to the B.C. Cancer Agency to have it funded for all patients as part of the health care system.